Look here for answers to your hummingbird questions. Is it really a hummingbird? If you're having trouble identifying a hovering, hummer-like animal - especially if it has yellow near its tail, or if it has antennae - it is probably a hawk, clearwing, or sphinx moth. These large insects comprise dozens of species of varying coloration and size, but their flight and feeding patterns are quite similar to those of hummingbirds. Many of them are active during the day, instead of being nocturnal like most moths. Here's a great reference website, Butterflies and Moths of North Americas. There's also a good moth article from the Missouri Department of Conservation here. Click the photo to see a movie of a moth. There's a hummingbird trapped in my garage! The government insists that all garage doors have red emergency release handles. Unfortunately, to a hummingbird they look a lot like trumpet creeper flowers, one of their favorites, and they fly in to investigate. But hummers aren't particularly analytical and don't have a natural concept of ceilings, and when they get scared their immediate reflex is to fly straight up, which only compounds the problem. In an hour, a trapped and exhausted hummingbird can starve to death. What to do? First, keep pets and kids away so they won't make the bird more anxious, and try hanging your most popular feeder in the door opening and stand back. Sometimes this will bring a hungry bird to feed, and it may fly off in the correct direction when it's finished. But this doesn't always work, and you shouldn't waste too much time - the bird's clock is ticking. If the hummer isn't gone within 10 minutes or so, turn on the inside garage light, close the overhead door, and get a flashlight. When the hummer flies over a clear section of the floor, turn off the light. Hummingbirds have poor night vision and don't like to fly in the dark, and the bird will flutter gently to the floor. Turn on your flashlight, find the bird, and scoop it upgently in your cupped bare hands. Have an assistant open the door, and carry the hummer away from the garage. Offer the bird a drink by holding it close to the feeder, but don't try to force it. After it drinks, or refuses to drink, open your hands, and when the bird reorients itself, it will fly away - probably straight up. It may lie still in your hand for several minutes, or it may leave immediately. Hummingbirds don't usually carry parasites, but wash your hands afterward anyway. To prevent a recurrence, keep your garage door closed when you don't actually need it open. You should also ignore the government and remove the temptation, by painting the release handle a dark color (black is good), or at least looping it up out of sight. Look for and hide any other attractive red items, such as paint can labels. Remind your neighbors, gently, of the trouble with red garage door release handles. Note: if your garage has windows and cannot be darkened, this rescue technique won't work. Instead, hang the feeder high up, inside the garage, so the bird can feed itself and rest comfortably. Leave it alone, and leave the door open in case it calms down enough to figure out how to leave. Near dusk, the flashlight technique will work better. Help! I found an injured hummingbird. If you know your local hummingbird rehabilitation agency, call them immediately. For their phone number, look in the phone book or ask your local animal shelter, zoo, parks department, or conservation agent. I found a baby hummingbird. Now what? The first thing you should do is nothing! Look around: is the bird's mother waiting for you to leave so she can feed it? (Only the mother participates in the nesting duties.) 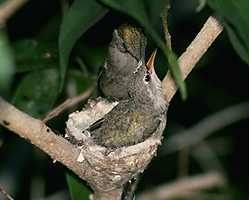 Occasionally, hummer nestlings fall over the side, but, like other birds, they're rarely abandoned by the parent. If you find a nest on the ground with eggs or chicks still in it, put it back. If unbroken eggs and live chicks are found out of the nest, put them back in. You may need to tie or tape a small box to the tree limb and put the nest inside (it doesn't have to be in exactly the same location, the mother will find her babies). Leave the top open. This is usually all you need to do; it's worked in many, many cases of nests knocked down in storms. Always wash your hands after handling any wild animal. If it's very young and helpless, not fully-feathered: If you can find the nest, put it back. If its mother doesn't appear in a half hour, call your local wildlife rescue organization: the mother may have been killed by a predator, window hit, etc., and the nestling will need rehabilitation help to survive. (These folks are licensed only after extensive training, and it's not legal to capture or technically even touch a wild bird without state and Federal permits, except under the supervision of a licensed individual, so please don't expose yourself to legal problems. Caring for baby hummers is neither easy nor straightforward - e.g., most of their natural diet is partially-digested insects, shoved directly down their throats all the way into their stomachs. If you can't find a bird rehabber in the phone book, call your local animal shelter, zoo, parks department, or conservation agent to get the number.) If you can't return the bird to its nest, call wildlife rescue for instructions. If the nestling is well-feathered and can perch, but can't fly: Put it back in the nest if you can. Otherwise, try to place it on an interior branch of a shrub, where it will be safe but its mother can feed it. Again, keep a lookout for the mother, and if she doesn't appear, or if the baby won't stay in the nest, call the rehabber. Feathered-but-flightless hummingbird nestlings often jump out of the nest if orphaned. If it's not apparently anxious, it may simply be a fledgling in the process of learning to fly, and the best thing you can do is keep children and cats away until it flies off. If it's relentlessly calling for its absent mother, it may be an orphan in need of rehab. If it's injured , call wildlife rescue immediately. If you can't save the bird and it dies, the biology department of your university will appreciate the opportunity to obtain it as a study specimen; we know relatively little about hummingbirds, and every opportunity to learn more helps the ones still alive and still to be born. Please accept that not every baby bird will grow to adulthood; some are deformed, some are sick, and some are just unlucky. No North American hummingbird is endangered, and natural selection favors individuals that survive without our help: this is how species become more successful, which must outweigh the welfare of any single bird. The decision to help is yours alone, and no one need feel guilty for action or inaction. But please call the pros for advice before risking making the situation worse; in many ways, young hummingbirds are not like our other familiar species, and few "civilians" are equipped to care for them properly. One more thing: while you are admiring a young bird or a nest, there may be other eyes looking at you. Predators such as crows, jays, roadrunners, cats, and mice all eat baby hummers, will wonder what you find so interesting, and will investigate after you're gone. Use binoculars to watch from a distance as much as possible. For more information about the behavior of hummingbird nestlings, see Penny Elliston's research on Black-chinned Hummingbirds. There's not a lot of data to work with, but most experts think the average lifespan of a hummer is 3 or 4 years. The record was a female Broad-tailed, banded as an adult in Colorado in 1976, then recaptured in the same location in 1987, which would have made her at least 12 years old. What animals prey on hummingbirds? Although various larger birds, snakes, and mammals raid hummingbird nests for eggs and chicks, predation is not a major cause of mortality in adult hummingbirds. Animals known to have caught and eaten hummingbirds include cats, small hawks and owls, shrikes, roadrunners, orioles, tanagers, large flycatchers, grackles, herons, gulls, largemouth bass, frogs, spiders, and praying mantises. How fast do hummingbird wings beat? How do they move? It depends on the size of the bird. The largest, the Giant Hummingbird, has a wingbeat rate of 10-15 per second. The fastest recorded rate was about 80 per second, on a tiny Amethyst Woodstar, and the slightly smaller Bee Hummingbird - the world's smallest bird - may have an even faster rate. Common small North American hummers like the Ruby-throated and Rufous average around 53 per second in normal flight. How fast do hummingbird hearts beat? A rate of 1260 beats per minute was measured in a Blue-throated Hummingbird. In torpid hummingbirds, the heart rate can drop to 50-180 per minute. by arriving first, the earliest males have their choice of the best territories, which improves their chances of attracting females for breeding. But this advantage must be balanced against the risk of arriving before food is plentiful. females - who will soon be nesting - will find more and better-developed flowers on the spring migration route if they leave somewhat later; in promiscuous species such as hummingbirds, which do not form pair bonds at all, breeding females are more valuable than males, and a reliable food supply reduces their risk. the early fall departure of the males may leave a richer diet available for the developing young of the year. The brilliant, iridescent colors of hummingbird plumage are caused by the refraction of incident light by the structures of certain feathers. Like any diffraction grating or prism, these structures split light into its component colors, and only certain frequencies are refracted back to the viewer. The apparent color of any particular part of a feather depends upon the distance between the microscopic ridges in its gridlike structure. The resulting colors are much more vivid and iridescent than those of birds with only pigmented feathers. Not all hummer colors are due to feather structure, however; the duller, rusty browns of Allen's and Rufous Hummingbirds are the result of pigmentation. Iridescent hummingbird colors actually result from a combination of refraction and pigmentation, since the diffraction structures themselves are made of melanin, a pigment. Are there any white hummingbirds? Not normal ones, at least not in North America. But a few albino hummers are reported every year. Here's a white Ruby-throat that was photographed on the porch of Clifford Heil's home in Cobden, Illinois. It's leucistic, also known as partial albino: full albinos have white feathers, pink feet and bill, and red eyes. This photo appeared on the cover of the 8/5/97 Southern Illinoisan, and was taken by staff photographer Joe Jines. Thanks to Jay Stemm for sending it to me. There are more photos of white hummingbirds on this page. Juvenile or Female? It's easy to tell female hummingbirds from young of the year ... if you can get close enough for a good look. Until their first adult molt, juvenile hummers' green contour feathers have a thin, tan or light gray outer edge. This is most apparent on the head, and gives a scaled appearance. The most reliable indicator of youth is yellow skin inside the mouth, easily seen if the bird's bill is open, but only very young birds show any yellow "lips" externally. Many young birds will also show broken streaks of dark feathers, like a "5 o'clock shadow." A few young males will develop one or more iridescent gorget feathers before leaving in the fall (young male Anna's may also have some red crown feathers). Unless a young bird has iridescent throat feathers, it's generally not possible to distinguish male from female juveniles unless the bird is in-hand (such as during banding) and close examination of certain other structures is possible. Do hummingbirds migrate by riding "piggyback" on other birds? I believe it was John J. Audubon who, if not started, helped to strengthen this myth. As you may or may not know, he shot and ate many of the birds he painted. He reports shooting a goose and upon retrieval, turning it over and out flew a hummingbird. I'm afraid I don't have the book in hand nor the source, but I do recall reading this either from his journals or another creditable source citing Audubon. Therefore, this "myth" may have been started by the namesake of the major bird society in this country. There is not a shred of evidence to support this whimsical concept, however colorful the idea may be. [humor alert!] Perhaps, as one wag postulated, a hummingbird was once seen carrying a goose back to the nest in her talons, to feed her hungry chicks. Hummers are fully capable of traveling astounding distances on their own wings; it is generally accepted by scientists that most Ruby-throats fly non-stop across the Gulf of Mexico in the spring, and probably in both directions. NO MORE HUMMERS! Where'd they all go? This didn't happen last year! Or did it? Welcome to the nesting season, folks. I'll discuss Ruby-throats in particular, but similar principles probably apply to most other species. Shortly after arriving, the females establish a nesting territory. Ruby-throats prefer secluded wetlands for nesting, if available, and proximity to your feeder is not an issue; in fact, females don't like to build nests in a male's feeding territory, and your feeder is probably part of one. Visits to distant feeders take too much time away from the eggs. When the chicks hatch, they need protein to grow, not sugar, so their mother spends most of her time catching small insects and spiders for them. During this period, I personally still see a male or two at my feeders, but typically only early or late in the day. I suspect that once their breeding duties are over, males tend to abandon territories and forage more widely to fatten up for migration. After the chicks fledge (leave the nest), expect the number of hummers at your feeder to be double what it was before the "disappearance." As summer progresses, there will be fewer natural hummingbird food sources available in many parts of the continent; feeders can have a real positive impact on the number of birds that survive, especially in the dry Midwestern U.S., so please keep them clean and fresh. And keep notes on your tiny visitors, if you like, so you can verify for yourself that this is a normal, annual process. When should I take down my feeder in the fall? All good things, as they say, must come to an end. Unless you live in California, that usually includes hummingbirds, at least until next spring. Depending on where in North America you live, the southward migration typically occurs between July and November. Here in St. Louis, the last birds are seen around October 15, unless an earlier hard frost drives them south ahead of schedule. Hummingbirds migrate in response to hormonal changes, which are triggered by decreasing length of daylight; nothing you can do will make them stay too long, so it's not necessary to stop feeding them to force them to go south. On the contrary: they will need to fatten up to nearly double normal body weight to survive the journey, and thus appreciate your feeder more than ever up until literally the last minute before they depart. I recommend continuing to maintain at least one feeder for a week or two after seeing your last hummer of the season. Sometimes an individual bird can't migrate on schedule, due to illness or injury: these late migrants in particular will appreciate having a reliable source of food at a time when few natural flowers are still in bloom. There's no need to risk your feeder freezing solid, though, so you needn't get carried away with the concept. EXCEPTION: If you live in the southeastern U.S., leaving your feeder out until at least Thanksgiving may attract one of the atypical Rufous or other hummingbirds that are reported more and more often each winter. Some theorize that, while most Rufous migrate north up the west coast in spring then head south down the east slope of the Rockies in fall, a few spend much of the summer traveling eastward across Canada and the northern U.S., and return to Mexico via the eastern seaboard and Gulf states. Others think these birds come directly from the mountain states. There's a new theory that they migrate normally into Mexico, but dry winter conditions reduce the food supply to the point that some birds are forced to look elsewhere, and follow the Gulf coast northeastward into the American South. Much more research is needed, and the truth may involve a combination of these scenarios. A smaller number of western-species hummingbirds may appear from late August through January in any state east of the Rocky Mountains. Since natural sources of food for these birds are significantly diminished in sub-freezing weather, feeders may contribute greatly to their survival chances. One Alabama contributor hosted a winter Rufous in 1995/96. Don't forget to keep the feeder clean and the syrup fresh, the same as in summer. Please accept that hosting a winter hummingbird implies a commitment for the duration of its stay. A 4:1 syrup mixture will start to freeze below 27° F, but a small floodlamp in a clamp-on reflector can extend that to near zero. Keep the lamp at least a few feet from the feeder. Anna's Hummingbirds in coastal California, Oregon, Washington, and Vancouver Island do not migrate at all, and a year-round feeder usually means year-round birds. Farther inland, Anna's may move seasonally to make best use of local resources; these movements may be more attuned to elevation than to latitude. Several species of hummers spend the winter in modest numbers along the Mexican border. Since winter in most of the southwest offers less natural food than in summer, feeders become important sources of energy to these birds. The Taino Native American people were the first people to meet Columbus in 1492. The Hummingbird is the symbol of the spreader of life on the Earth. It also symbolizes the rebirth of the Taino Indian Nation of the Caribbean and Florida. We also call our Warriors, Colibri Warriors (Hummingbird Warriors), as the Hummingbird is very peaceful but, it protects it own homeland with the heart of a Eagle. Our history tells us the small Hummingbirds were at one time small flies that Agueybaba the Sun Father transformed one day into little birds.